If this method is good enough for Victoria Beckham, it's good enough for us. Victoria Beckham just loves the Honestly Healthy cookbook. It’s a collection of recipes based on the alkaline diet – a diet which aims to nourish the body without placing the digestive system under strain. We figured we’d give it a go ourselves so have chatted to the book’s author, renowned organic chef Natasha Corrett. Having developed the Honestly Healhty cookbook alongside expert nutritionist Vicki Edgson, there is no one in a better position to gives us tips and advice on how we can eat our way to bikini perfection this summer. Let the feasting commence (in controlled portions, obvs). 1. Drink plenty of water to stay hydrated. It sounds obvious but hydrated skin is the key to looking good. 2. Eat plenty of avocado because it’s high in Vitamin E, an antioxidant which helps to repair and protect your skin, minimising fine lines and wrinkles. Try it on toast for breakfast. 4. Cut out processed foods, they are just going to clog your skin and pores up. 1. Hot water and lemon is the best way to start your day. This helps to bring your acidity levels down after a night of natural detoxing. 2. Half your portion sizes. It’s not easy, but you’ll notice the difference. Cup your two hands together and that is the size of your portion should be having. No exceptions. 3. Eat lots of green leafy veggies. Kale and spinach are particukarly beneficial. 4. Cut out processed sugars and refined carbohydrates. 5 Eating regular meals helps your metabolism, so don’t skip or starve yourself. 1. Eating a predominately alkaline diet will give you naturally shiney hair and strong nails, it’s just part of the package. The basic premise is to increase your intake of alkalizing foods (such as fruit and vegetables) and reduce how much acid foods you eat (such as meat, salt, and refined grains). 2. Make sure you eat plenty of foods full of nutrients, as close to how Mother Nature produced them as possible, meaning no processed foods. 3. Try and incorporate more essential fatty acids into your diet for healthy hair – these can be found in oily fish and nuts. 4. A lack of zinc can mean weak nails and dry skin. Almonds, peanuts, pine nuts, cashews and sunflower seeds are great way to boost your zinc levels. Who said a full English need be greasy and fattening? Perfect for a Sunday brunch or even a scruffy supper. You can play with the recipe – scramble or boil the eggs, and add whatever is in the fridge. Place the asparagus, tomatoes on their vines and the mushrooms with garlic on top on a baking tray (cookie sheet), drizzle with a teaspoon of the olive oil and bake for 20 minutes (cherry tomatoes work well, too, but they’ll need a bit less time, just till the skins split). Remove from the oven and sprinkle the grated goat’s cheese on the mushrooms and allow to melt. Meanwhile, fill a frying pan with water to within 2.5cm (1in) of the top, bring to the boil, then reduce the heat to a simmer. 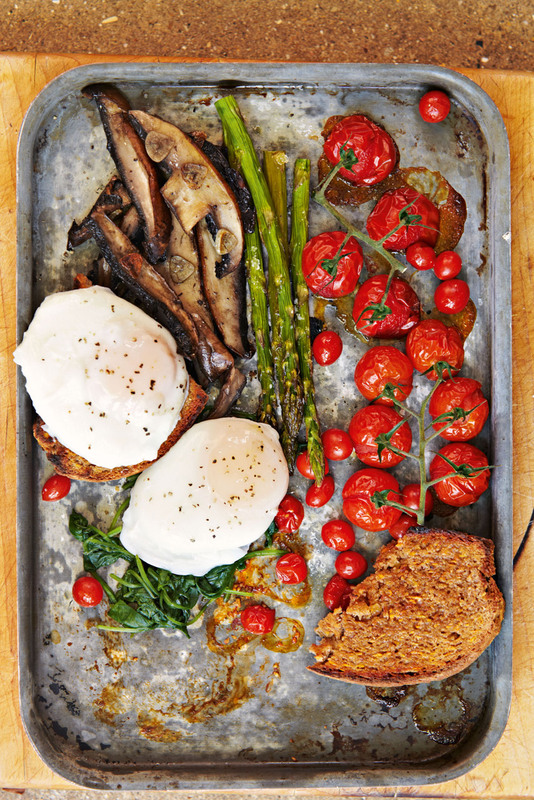 When the asparagus and mushrooms have been in the oven for 15 minutes, crack the eggs very carefully into the simmering water and poach for 3 minutes, making sure that the water completely covers the eggs – if necessary, spoon the cooking water over the eggs while they cook. Place the spinach in a bowl, cover with boiling water and leave to stand for 2 minutes, then drain well and add the remaining olive oil and the lemon juice. Divide between 2 serving plates. Carefully remove the eggs from the water with a slotted spoon and arrange on the spinach. Place some mushroom on each plate with the asparagus and the vine tomatoes. Sprinkle with black pepper. Serve immediately, with a piece of gluten-/wheat-free bread, if liked. Try this fun party game – ask your guests what unexpected green ingredient they think is in this velvety mousse. They will never guess. Melt the coconut oil in a heatproof bowl set over a pan of hot water, then transfer to a blender with the avocado flesh and water and whizz until very smooth. Add the cacao powder and agave syrup or honey and whizz again until completely smooth. Taste and add a little more agave syrup, if required. Put the mousse in a dish for two or, if you prefer, divide the mixture between 2 ramekins. Chill in the refrigerator for at least one hour. 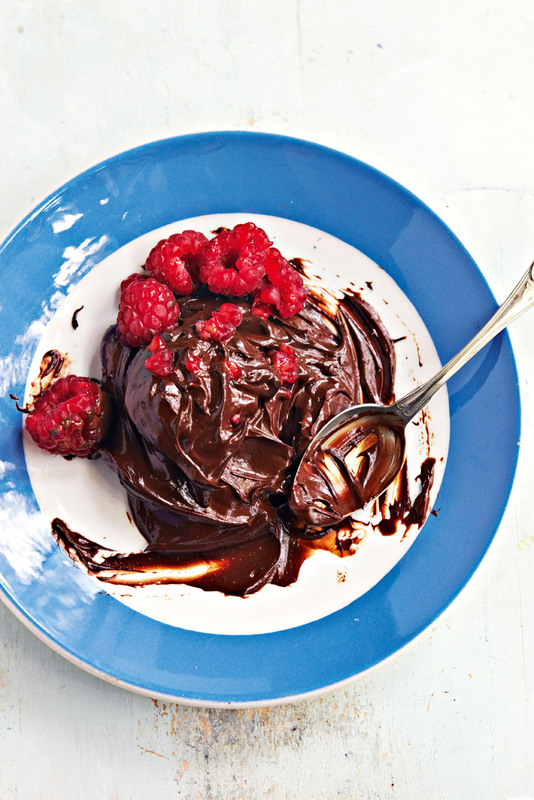 Serve with raspberries or blackberries. Beautiful to present on the table for a dinner party as a starter or even as your main course, served with brown rice and a crunchy salad. If you are vegan, just leave out the feta as the cashews provide plenty of protein. Preheat the oven to 150°C/300°F/gas mark 2. Next, trim the stalks off the courgettes (zucchini). 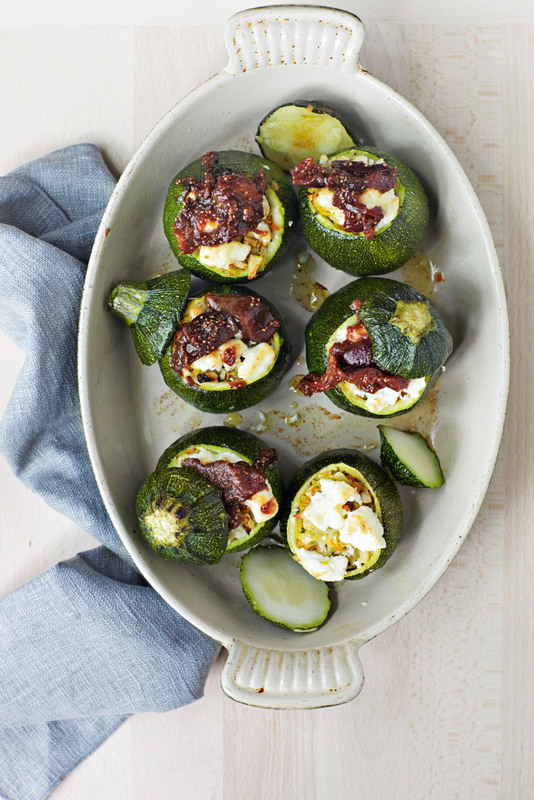 Brush a roasting tin with ½ teaspoon of the olive oil, add the courgettes (zucchini) and garlic and roast for 50 minutes, until tender. Remove from the oven, leaving the oven on. When the courgettes (zucchini) are cool enough to handle, carefully scoop out the flesh and set aside. Heat the remaining oil in a pan and gently sauté the onion for 5 minutes. Add the carrot, thyme and oregano and sauté for a further 5 minutes, or until the carrot is soft. Add the courgette (zucchini) flesh and chopped artichoke hearts and sauté for 2 minutes. Stir in the lemon zest, salt and chopped cashews. Divide the mixture between the courgette (zucchini) shells, stuffing it in tightly. Top with the crumbled feta and return to the oven for 15–20 minutes or until the feta is golden. Serve the courgettes (zucchini) with the Fig Jam (see below) and a simple salad of rocket (arugula) leaves, cherry tomatoes and peppery radish sprouts, drizzled with a good olive oil. While the courgettes (zucchini) are in the oven, chop the figs and place in a saucepan with the balsamic vinegar, rice syrup and water. Simmer gently until the figs become soft and sticky.